Isn’t it funny how we do this? I also think of ‘belly aching’ as rumination. Either way, in a modern life these kind of thoughts don’t produce any value. Not like a cow, where ruminating makes the bits of food break down until they are finally digested of all their nutrients and the waste is whisked away. Rumination of thoughts inside my head often feels more like negative self talk. I keep chewing something over and over without gaining any new insights or perspectives. In fact, the event or the information continually feels bad and does not get any better. I know I’m not the only one to do this. However, that fact doesn’t bring me any consolation. The memes which proclaim, “speak to yourself as if you were your best friend” and other such phrases, do no good either. Sometimes the only piece of advice worth getting is something grandma might have said, when she was getting rather frustrated with all the drama. She would have told me to “quit belly-achin’ about what isn’t working.” (Actually, my grandmother never said this, she was way too proper, but she probably thought it). 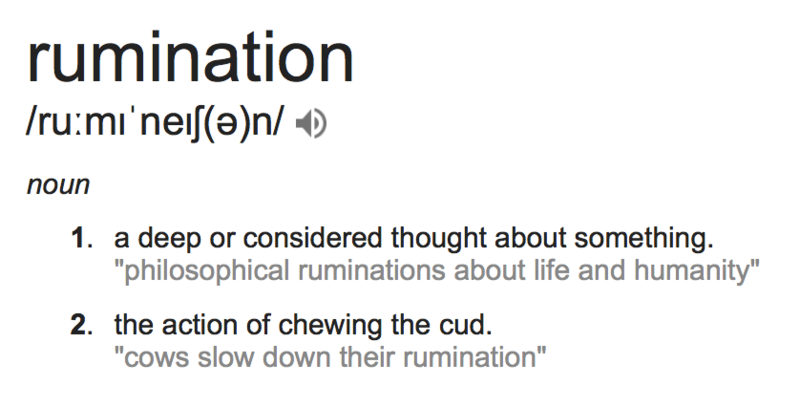 It is only now, in hindsight, I can see how much time I have wasted on rumination. Identifying a bad habit, should be the first step to breaking it, but I’ve not had such an easy time. Getting bogged down in the process of solving a problem can feel like an endless loop, as well. Teasing out the differences of these thought cycles and knowing when it is ‘time to get on with it’, has been tricky. One of the techniques I have started to use recently, is the practice of the ‘morning pages‘. Julia Cameron describes the process as clearing out your consciousness of the negativity you wake up with. All the petty, silly, bad thoughts that would otherwise knock around your mind all day long. At first, I didn’t realize how many of those demons I have locked in my head. Now, my journal pages are full of them, they have been exorcised from my mind. At least, for that day. However, some of the more pesky thoughts are rather persistent. They keep coming up, every morning. So I write them down again. And there they sit in my notebook for another 24 hours, giving me a reprieve. I share all of this because the quote, “quit belly-achin’ about what isn’t working”, came to me from a book review, for Fruitless at 40: Rediscovering My Creative Power, in a round about way. The other morning, even after doing my morning pages, I was still feeling a little down, until I opened a series of emails from my Dad. He had recommended my book to a friend of his and she had some wonderful things to say about it. I’ve already started reading it, and am Loving it! Wow! I’m Blown Away by how this is Speaking to my spirit. This is Powerful stuff, and So Well Written! Plus, she Inspires me to quit belly-achin about what Isn’t working, and work harder to figure out what IS! I’m feeling more (personally) optimistic than I have in a LONG time, and for that I am Grateful! Needless to say, I was extremely inspired to receive these kind words! It made me think that possibly there are more of us, ‘out there’ who are like-minded. The beauty of the internet allows our paths to cross, where it might not normally be the case. So, if these words speak to your soul, or you know someone who might need inspiration, please pass this post along! There are 2 places to download my e-book. The first is from my website, Daily Creatives, where there is a full version including all the photos. The other place is Amazon, where the light version is optimized for kindle. Thank-you again to everyone who helped and inspired me along the way and to all those who purchased my book when it was first released last year. It has been a great deal of fun to write and my next collection of thoughts are being gathered now. My process is a bit like Mozart’s. All the ideas are in my head, ready to go. I just need to write them down! ← Chocolate and cava for breakfast?